Congratulations to Scott Moldenhauer, Billy Christopoulos, Michael Bunn, Sean Murphy, and Laythe Jadallah. All five were selected in the USHL Entry Draft on Tuesday May 22nd. We wish them luck when they report to their respective camps! They join other Jr Hurricane players previously selected in the USHL Entry and Futures Drafts (Trevor Owens, Sean Romeo and Brian Moore) who are currently playing in the league. These selections further highlight the Carolina Jr. Hurricanes program as the top development program for hockey in the Carolinas. Good luck boys! RYHA would like to thank everyone who participated in the spring for their continued support of RYHA programs and leagues. Logan Halladay from the Junior Hurricanes U16 AAA team was selected in the USHL Futures Draft yesterday by the Waterloo Blackhawks! He was chosen as the first goalie taken in the futures draft, selected in the 3rd round. Logan represented the United States in the first ever Youth Winter Olympics this past January and was one of a very select group invited to attend the USA Hockey Under 17 National Team Camp. "Logan is an aggressive goalie with lots of athletic ability, but it is his work ethic that has helped separate him the past couple of years. I am thrilled that his hard work paid off!" said RYHA Director of Goalie Development Richard Shulmistra. Congratulations to the following RYHA Junior Hurricanes players who were selected for the upcoming Southeast District Camp. The Carolina Junior Hurricanes would like to congratulate 5 players from the Carolina Jr. Hurricanes U18 AAA Team for being selected to the NAPHL Top Prospects Tournament. 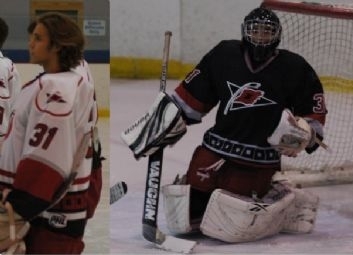 Goaltender Tucker Murphy, Defensemen Grant Universal, Jason Lem and Forwards Tyler King and Michael Merritt have all been selected to play in the tournament in Frisco, TX on May 4th- 6th, 2011 during the NAHL National Finals. Tucker, Grant, Jason, Tyler and Michael were selected in a group of the top 80 players from the NAPHL during the regular season and playoffs. The U14 Bantams are 1:1 through Thursday's action, winning their first game on Wednesday in OT 4:3 against the Arizona Hockey Union Knights. The Bantams lost their second game 4:2 Thursday against the Fort Wayne Comets. The Jr Canes face Casco Bay in their third and final preliminary round game Friday at 4:00p. The Bantams will need a win to move onto the Quarter Final round. The U18 Midgets are off to a great start going 2:0 in their opening games. The Jr Canes defeated Team Wyoming on Wednesday 5:4 and Wheeling Amateur Nailers on Thursday 6:4. The Midgets play the Oklahoma City Oil Kings Friday at 2:00P in the final preliminary round game. The U14 Bantams defeated the Casco Bay team in their final preliminary game, 7:0, and advance to the quarter finals at 11:45a Saturday 3/31. They will face the Ashburn Extreme 97 team. The U18 Midgets lost their final preliminary game in OT, 3:4, against the Oklahoma City Oil Kings. Despite the OT loss, the Jr Canes accumulated enough points to move on to the semi-final round on Saturday at 4:00P. The Jr Canes will face the Golden Eagles from UT. 7:00PM - The Bantams win in semi-finals, 3:2, and advance to the U14 Tier II 2A Championship game Sunday April 1 at 1:00p. They will face the Affton Americans. The Midget U18s won the semi-final game 4:3 against the Golden Eagles. They will face the Oklahoma City Oil Kings in the final championship game Sunday morning at 8:30a. The Jr Hurricanes Bantam U14 team defeated the Ashburn Extreme 5:2 in the quarter finals and move on to the semi finals tonight at 6:15p. They will face the Ft. Wayne Komets. The Junior Hurricanes Midget U18 AA team lost in the finals of the U18 Tier II 1A tournament this morning, 3:1, against the Oklahoma City Oil Kings. After fighting back from an early 3 goal deficit, the U14 Bantams were unable to keep the momentum. They lost in the Tier II 2A finals 6:3 to the Affton Americans. Congratulations to both Jr Hurricanes teams for an outstanding season and representing North Carolina and the Junior Hurricanes program so well. Josh Wesley from the Jr Hurricanes program has been named to the USA Under 17 National Team Development Program (NTDP) in Ann Arbor Michigan for the 2012-2013 season. Josh was one of three players from our program chosen to tryout for the team in March. Colin Muldoon has had the pleasure of working with Josh and these boys for many years and it is great to see their hard work pay off and Josh being one chosen for this highest honor. A special thank you goes to all these boys teammates, coaches, and parents over the years because nothing great is accomplished by yourself. Read more about the 2012-2013 Under 17 NTDP Selections. 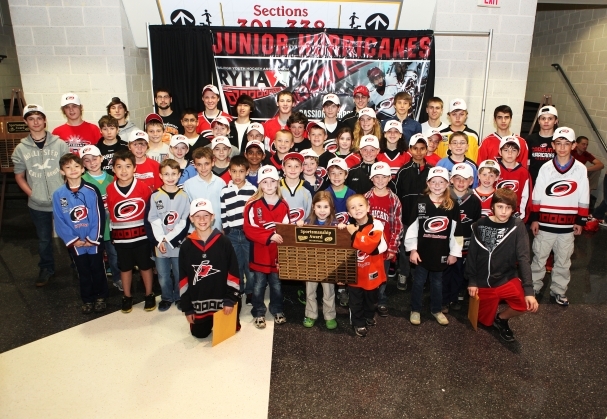 The Carolina Hurricanes and RYHA recognized the 2012 RYHA Sportsmanship Award Recipients with the RYHA Sportsmanship Award Night at the Carolina Hurricanes game. The players were selected by their coach to receive this award. This award was presented to each player in recognition of their hard work, dedication and respect to their peers, coaches, parents, and the great game of hockey. The players received a Certificate of Achievement and were also recognized with their name on a plaque. Below are the players that received the RYHA Sportsmanship Award and a group photo of the players that attended the game. Congratulations to all of our Sportsmanship Award Winners! 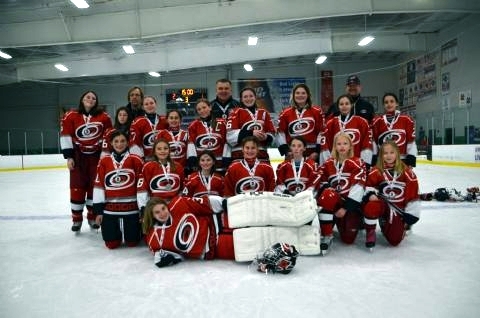 The U14 Jr. Hurricanes Girls select team finished in first place at the March Pony Tail Tournament in York, PA. U10 to U19 girls teams from New York to Carolina come to compete in this annual tournament that is held in January and again in March. The U14 Team composed mostly of 13 year old players had four straight wins along with 15 goals and two shutouts. The Princeton Tiger Lillies fell to the Hurricanes in the championship due to strong team play which included two short handed goals. Despite being a part time team during the 2011 season the girls played extremely well together. Members of the team included young ladies from Charleston SC, Greenville, Charlotte, Wilmington, Greensboro and Raleigh. Special thanks to U14 Coach Steve Henley, Steve Crooks, Tammie Wilson as well as team manager Julie Tolzman. Each year in Ann Arbor Michigan, USA Hockey hosts a tryout with their top 40 sixteen year old prospects in the country. From this tryout group a team is chosen to compete for the US NTDP Under 17 team. This season three Jr Hurricanes have received early invites to this prestigious camp. They are goaltender Logan Halladay, forward Laythe Jadalla, and defenseman Josh Wesley. This announcement marks the second season in a row that we have had players represent our program at the final 40 camp. Last season former Jr Canes defenseman Charlie Pelnik had the honor of attending the camp. These players have shown the commitment to what it takes to play at the highest levels offered in hockey. The Jr Hurricanes thank these players and their committed teammates for being examples to our next generation of players that come through our program. It is because of Logan, Josh and Laythe’s dynamic styles developed through their years of hard work that these boys are able to skate at this level. Congratulations to Logan, Josh and Laythe for reaching this level of competition as you represent yourselves and our area. U16 RED team went into the post season tournament as the #2 seed behind Charleston. They lost their first game on Friday night 4 to 1 to the Jr Canes (WHITE) and then managed to come back and win the next two games (Charleston and Jr Canes BLACK) putting them in the finals Sunday afternoon. The team revenged the loss from Friday with a 6 to 3 win over the Jr. Cane’s (WHITE) and the boys finished the year 30-6-4. 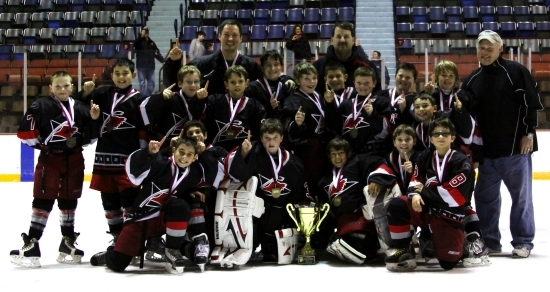 They finished 2nd in the November 2011 Congressional Tournament (Washington DC), 1st in January 2012 Congressional Tournament (Washington DC), second in the CHL league, 1st in the CHL Skills competition, and became the CHL Post Season Champions. It was a Great effort all year by an extremely fine bunch of young men. The Correlation? - Hard work, strong practice, high game effort, and heart made these young men winners. 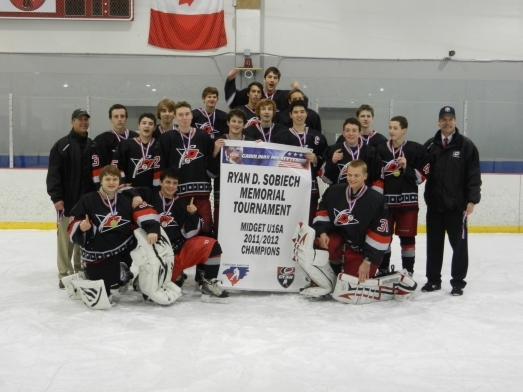 Congratulations Team U16 RED. 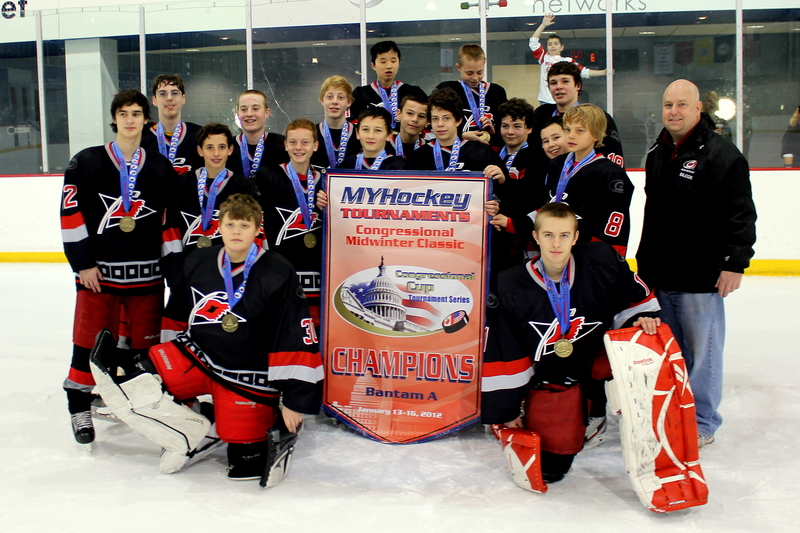 The Carolina Jr. Hurricanes Bantam A Red team made the drive up to our Capital to play in the Congressional Cup Midwinter Classic with one goal, which was to bring back a championship banner to Raleigh. The Canes' first opponent was the New Jersey Devils and the first game of the series had the same thrill and rivalry of a real NHL game between the Devils and Canes. It was a late night start to the tournament opening rounds for the Jr Canes, but they came to play hockey with a convincing 6 to 2 win over their east coast rivals Jr team. Our second game on Sunday was against the Raleigh cross town team the East Coast Eagles. In a hard fought game where neither team could get an edge the eagles were able to score a late 3rd period goal and then an empty net goal taking the win in a final 3 to 1 over the canes (The Jr Canes knew in the locker room that we would meet again in their quest to take home the banner and the wait would not be long). With the final win against the Piedmont Predators late Sunday night with a solid defensive game and strong offensive scoring, the Jr Canes solidly advanced to the championship round setting up the two home town Raleigh teams to compete in our Nation’s Capital for the first place title and winner of the Congressional Cup. On the Monday holiday, the mood was quiet but resolved in the Canes’ locker room. The Canes were looking to capitalize on good defensive positioning and excellent passing down-low in the zone. The team was ready to use this newly found confidence to again play the Eagles in the Washington Capital’s Training facility at Kettler Iceplex for the Championship. The team was playing their best hockey yet and they jumped out to a 2 to 0 lead with a strong push on offence coupled with solid defensive play. The Eagles however were not going to let up and the Canes found themselves with a 3 to 1 lead after 2 periods of hard grinding hockey. Going down the stretch the Canes scored two more goals, and despite the Eagles late game score and relentless attack the Canes held their ground for the gold medal in a 5 to 3 win over their cross town competitor. Congratulations to all of the players, coaches and parents of the Jr Hurricanes Bantam A Red team for a great Holiday Weekend Championship!!!! 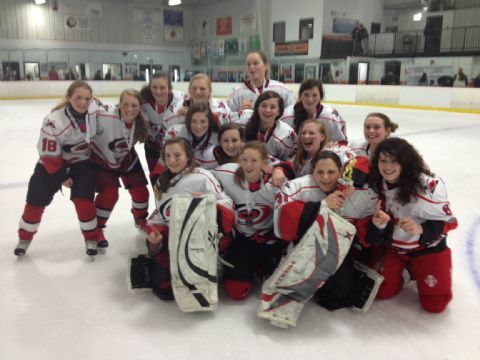 A great weekend for the Jr. Hurricane Girl's program! The U12 Select team took 2nd place in the U12B division at the Martin Luther King Annual Pony Tail tournament in York, PA. The team allowed only two goals in four games and tied an upper bracket U12A team in a non-pool event. Our ladies even had the U12 Pittsburgh girls chanting "Let's go Hurricanes" for them in the final game. The U10 Jr. Hurricanes also had a strong showing with a team composed of girl's from all over the state of North Carolina. They won two games handily and lost two close ones to girls that play together all season long. Not bad for a team of young ladies who mostly play half-ice games and have never played together as a team! Congrats to all the players and coaches for a fun and successful January Pony Tail! Thanks to all the parents, managers, families and coaches who made it happen. We are proud to announce that RYHA raised over $3200 during our Breast Cancer Awareness Drive!! We would personally like to thank the Team Managers for their hard work and dedication collecting donations and getting decals on the kids. We especially would like to thank our Membership for their donations and support of breast cancer during the month of October. We are especially proud of our players wearing PINK in support of the cause. PINK Awareness was displayed everywhere we went! When it’s cancer, every dollar raised counts. Every minute of the year an American dies of cancer. One of every two men and one of every three women are diagnosed with some form of the disease in their lifetime. Every time that we raise dollars for research it helps……. if not ourselves, then someone in our family or someone we know. How appropriate we donate our funds during Jimmy V week here in Raleigh. On behalf of the entire organization, thank you for making our breast cancer awareness month such a success! The Junior Hurricanes Squirt AA team enjoyed a holiday tournament in Hershey after Christmas. Their first opponent was North Jersey Avalanche. The game started with great pressure by the Hurricanes. On a faceoff in the offensive zone on the second shift of the game, Jacob Gavriluk won the faceoff over to Caleb Downs, who moved it back to the D. Cameron Anderson made a great D to D pass to Cameron Plants, who took a shot from the point; it missed the net but Caleb Downs picked it up off the boards and jammed it in front, where both Downs and Alex Straughn were digging in the crease. Downs managed to poke it in (twice, the refs missed the first time it crossed the line) for an early 1-0 lead. The Avalanche came back with pressure of their own and scored on a rebound in the last minute of the first period to tie the game. The second period was all Avalanche, but Addison Lawrence stood tall in the net and turned all the shots aside. The third period was more of the same, until there was only 3:33 left in the game when Downs picked up the puck in the neutral zone, carried it into the zone, slid it to Straughn who buried it inside the far post for a 2-1 lead. North Jersey Avalanche had one more scoring chance with an extra attacker in the last minute, but Lawrence again snuffed it out and stole the game for the boys. The second game was against Lehigh Valley and it started with some good Hurricane action: Luke Havener feeding it into the goal mouth where Devin Phillips missed a chance to tap one in, then fed his linemate Trevor Smith who also missed a tap in…but the momentum was building. Minutes later Downs sprung Daniel Nau for a 2 on 1 break. Nau made a nifty little pass to Gavriluk who lifted it over the goaltender, only to have it rattle off the post. Only a minute later, D-man Brian Fitz started the puck up the ice with a chip to winger Matthew Vicini for a 2 on 2 break. Fitz joined the play to make it 3 on 2, and Vicini dropped him the puck in the slot, where Fitz buried one past their keeper for a 1-0 lead. In the second period the game went back and forth with some neutral zone play before Lehigh Valley struck on a wide angle shot with the rebound popping out front and the opposing forward chipping it over a sprawling Jackson Shulmistra to tie the game at 1. The Jr. Hurricanes responded right back with a goal of their own immediately, as Nick Young moved it up to Trevor Smith with a nice bank pass, and Smith drove it wide and found Devin Phillips on the back door for a tap in. 2 to 1 lead. Early in the third period the Hurricanes struck again. Off an offensive zone faceoff, (shortly after a disallowed goal on the PK), Gavriluk won the faceoff to the middle where Alex Imposimato grabbed it and rifled a shot over the shoulder of a surprised Lehigh Valley goalie. 3 to 1. Lehigh Valley came right back though, and on the power play they took a shot on the rush. It was blocked, but bounced to a man open on the side and he fired it past a surprised Shulmistra to narrow the lead to 3 to 2. A shift later Phillips picked up a loose puck in the neutral zone and scampered in all alone, went to his backhand for a 4 to 2 lead. Not long afterwards, the ‘Canes thought they had put the game out of reach as the line of Nick Zacharewski, Vicini and Nau applied more pressure and “Big Z” tapped one that appeared to sneak past the goalie. The refs saw it the other way. The Canes sealed the deal when Straughn hit a streaking Downs on the backdoor for a tap in and a 5-2 victory. The third game was against the Valley Forge Colonials. The Junior Hurricanes thought they scored on the first shift when Phillips hit the post and the arena staff put the siren on. The players stopped, only the puck never went in! The Colonials took it down the ice on a 2 on 0 break. Trevor Smith showed why he is an assistant captain, never giving up on the play and breaking up the 2 on 0! Minutes later, after a Brian Fitz defensive stop, Vicini picked up a loose puck on a break and snapped home a high wrister for a 1-0 lead. The play went back and forth before Valley Forge scored to make it 1-1 half way through the second frame. The Hurricanes replied with 2 PP goals from Nick Young (both with good feeds from Chris Throndson on the blue line). Lawrence was solid all game long. Valley Forge tried to mount a comeback scoring their second but Vicini scored his second of the game to put it out of reach. The Junior Hurricanes finished first in their bracket and were headed to the semi finals. This is where they met the Hershey Jr Bears. The Bears jumped out to an early 2-0 lead, and put in a third on a 2 on 1 late in the first period. In the second period, Shulmistra closed the door, stifling a mini-breakaway with an old school slide. After the play, one of the Bears pushed Imposimato into the net and Shulmistra took exception to it, running the player over and taking 2 minutes in the process. The player was in the crease but the refs would have none of it. Then Phillips showed why he is the captain and decided to take charge of the game. He put in a shortie to make it 3-1, then stole the puck and fed Straughn in the slot to narrow it to 3-2 before the end of the second. The Bears tried to play solid D, and the Jr. Hurricanes found it tough to score, but the line of Zacharewski, Vicini and Nau kept the pressure on in the offensive zone. Phillips tied the game around the 5 minute mark, then scored the go-ahead goal with only a few minutes to go! Shulmistra had closed the door and Phillips sealed the deal with an empty-netter in the dying minutes and turned what was looking like a disaster into a trip to the finals! In the finals, North Jersey Avalanche were going to get another shot at Carolina. The game started with a BANG as Trevor Smith showed why his is an assistant captain, grabbing the puck off the hop and ripping it under the bar for a 1-0 lead. Minutes later he rode in alone and lifted a backhander over the goalie for a 2-0 lead. After a good keep-in by Anderson, Nau poked in a wrap around in a scrum for a 3-0 lead. Smith potted his third of the night to take a 4-0 lead. Addison Lawrence started the game and was solid, turning aside all the shots he was facing with ease. He gave way to Jackson Shulmistra just past the half way mark. North Jersey tried to mount a comeback in the third, scoring 2 to narrow the gap. The D stepped up and blocked some shots, Shulmistra put the clamp down, and Downs put in an empty netter to seal the deal with a 5-2 victory. After some great shot blocking, hard battles, and lifting a championship trophy, a massive chocolate bar was waiting for the boys in the locker room. It sure tasted much sweeter after a win! Way to go boys! RYHA sent two U8 Advanced teams consisting of players who signed up from the current six U8 advanced teams to the Thanksgiving weekend to Washington DC to play in the 2011 Congressional Cup. For most of the players and parents this was their first time at playing in a competitive travel tournament and most didn't know what to expect, but knew they were going to play hockey, lots of hockey. The coaches for the two teams only had two practices prior to the fist puck drop to reinforce with the kids off sides, icing and changing lines on the fly. The hard work paid off for both of the teams with Raleigh taking home 1st and 3rd place finishes out of the 5 teams in the U8/Mite division. Raleigh select Team #1 was themed by Head Coach Dave Jones's mantra to "keep the puck out of the heart" and Assistant coach Matt DiRocco asking the kids to "focus on the E for effort not the W or L". The boys had lots of energy until the end of the 2nd period of the Championship game. From there it was all HEART! I was so proud of the boys for digging deep the last 13 minutes of the 3rd period. It was emotional for me because I could see that the boys were so tired and they continued to give it their all even though there was nothing left in the tank. Said Head Coach Dave Jones. Outstanding playing by Ryan DiRocco(MVP), Luke Norman, and Liam Witchey and of course great goal-tending by Braden Stantz. No one can win a championship without great goaltending. Ryan DiRocco netted 20 unprecedented goals for entire tournament while Brayden Strong pulled through with a hat trick for the championship game. Raleigh Select Team #1 defeated the home ice Washington DC team in the Championship game 7-2 and 1st place overall in the tournament! RYHA Team #2: Mason Arbogast, Ben Bondranko, Ian Brewster, Scott Daniel, Justin Fuko, Dylan Hatcher, Hope Richards, Ethan Joshi, Andrew Throndson, Nate Glenn, Will Gaca and Sam Kasper. Congratulations to all of the skaters from the ADM Advanced U8 teams and next time you are at the Factory look for RYHA Select Team #1 championship banner hanging up at the rink! JR HURRICANE TO PLAY FOR TEAM USA! U16 AAA goaltender Logan Halladay (Cary, NC) has been selected to represent his country in an international tournament in January 2012. USA Hockey has selected a group of U16 players for a Winter Youth Olympic Games tournament in Innsbruck, Austria. The roster is made up of 9 forwards, 6 defensemen and 2 goalies. All 17 players were participants at USA Hockey’s Boys’ Select 15 National Camp this past summer. Team USA will compete against Canada, Russia, Finland and Austria. Logan Halladay was selected to attend the Warren Strelow Goaltending Camp earlier this year. The Strelow Camp is an event where USA Hockey selects some of the top goalies in the country and brings them up to Ann Arbor, Michigan. The goalies spend time with the National Program’s goalie coach along with some of the top junior and college coaches. It is an opportunity for USA Hockey to assess and train young talent and provide them with new tools and skills to work on. Logan Hallady has had a solid role model to look up to: Logan is the younger brother of U18 AAA Jr Hurricanes Captain Kyle Halladay. Kyle is known as a hard-nosed player that brings it every day, something that is rubbing off on his younger brother. Everyone involved with the RYHA would like to congratulate Logan Halladay on his selection and wish him luck in the tournament. 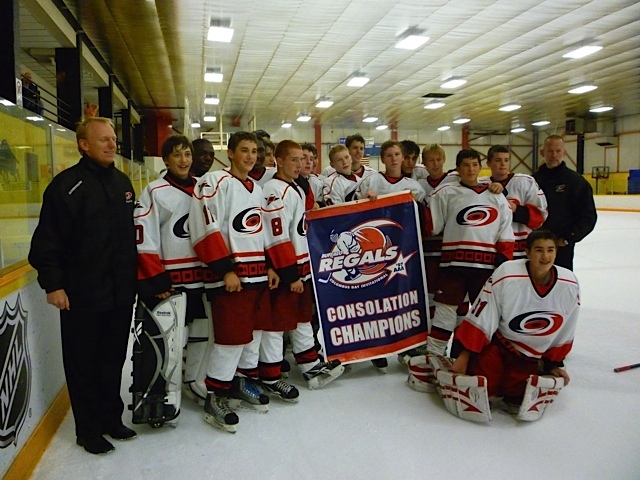 The Junior Hurricanes Bantam AAA team took silver at the Buffalo Regals 97 Tournament. The tournament benefits the Hasek's Hero's Foundation. 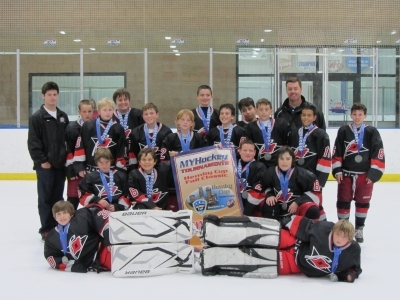 The Junior Hurricanes Pee Wee Black teams won 2nd place at the Hemby Cup Tournament in Charlotte this past weekend. The team played four tight games on the way to the finals, heading into the Sunday afternoon match against Charleston undefeated. Pee Wee Black kicked it off Friday afternoon with a 6-5 win over the Atlanta Ice Bandits, then followed it up with a 5-3 Saturday morning victory over the Florida Jr. Panthers. Saturday night they faced off against Ashburn Extreme, winning 3-2, and then battled it out against Greensboro for a 2-1 victory Sunday morning. The final game was a nail biter and despite the tremendous effort, the team fell in overtime, with a final score of 2-3. Coach Oury and Assistant Coach Hoey credit the entire team for their contributions. Goal tending was spot on, the defense was strong, knocking in a few goals, and over the course of the weekend’s play, goals were split nearly evenly between all three offensive lines . 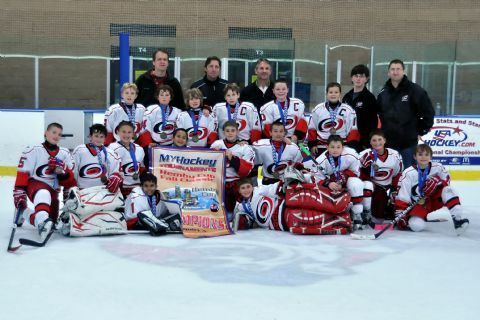 The Squirt A Junior Hurricanes travelled to Charlotte for the Hemby Cup the weekend of October 22nd. The tournament had 4 divisions with teams from Washington DC down to Florida. The Squirt bracket featured a four team round robin over the first two days. The Hurricanes opened with a strong performance against the Ashburn Xtreme from Washington DC winning 10 – 1 and getting their goals from five different players. The second game featured strong goaltending from Varun Atree and continued balanced scoring as the Hurricanes beat the Atlanta Ice Bandits 7 – 3. The final bracket game continued the strong goalie play with Christian Boccella taking a shut-out deep into the game and the Hurricanes continued their strong offensive showing with a solid 6 – 1 win against the Prince William Panthers. The Hemby Cup benefits the Presbyterian Hemby Children's Hospital & The Ronald McDonald House of Charlotte. Since 2001, funds raised have topped $750,000 and have been used to build a hospital playground, fund the Arts for Life program and purchase needed medical equipment and toys. $100 of each team's entry fee will be donated to the Hemby Cup Foundation. The final game opened with a ceremonial face-off between the teams along with patients from the Children’s Hospital. The final was a very balanced game between the Hurricanes and the Ice Bandits. The Ice Bandits took an early 1 – 0 lead but the Hurricanes ended up leading 2 -1 after the 1st and 4 – 2 after the second. The Bandits closed to 4 – 3 with 5 minutes to go but a the hurricanes closed the game out with a late goal and survived a late push by the Bandits to win the final and take home the Championship 5 – 3. The Hurricanes won the championship with a balanced offense that saw 9 different players score during the tournament, a strong defense that only allowed 8 goals over 4 games and outstanding goaltending. A great team effort that led to a great team result. Ask any coach in the USHL, OHL, EJHL, NAJHL, AJHL, Tier II Canadian or Major Division I college hockey and they know the Carolina Jr Hurricanes have one of the best youth hockey programs in the country when it comes to developing high end talent. Last season marks the fourth year in a row the Jr Hurricanes have had a number of our players drafted to the USHL and the OHL which are regarded as the top leagues in the US and Canada. In a recent weekend at the North American Prospects tournament in Blaine MN, Jr Hurricanes Midget coaches Mike O’Leary and Clay Cotie were approached by Michael Callan of the New Hampshire Monarchs, which is one the top teams in the EJHL (Eastern Jr Hockey League Tier 2 Jr A) with interest in some of our top players. The EJHL is a league the Jr Hurricanes will also look forward to placing players in the future. At the college level the Jr. Hurricanes produced Charlie Pelnik, the second youngest player ever to commit to the NCAA powerhouse The University of North Dakota Fighting Sioux. North Dakota has alumni such as Zach Parise of the New Jersey Devils and Jonathon Toews of the Chicago Black Hawks, so it goes without saying that these are schools that target top hockey talent for their teams. For such a young program, the Jr Hurricanes are extremely proud to be producing these types of results, which are a testament to the commitment of the Jr Hurricanes/Raleigh Youth Hockey Association (RYHA) philosophy of long term development in all aspects of the game. These programs were built with creating strong fundamentals on the ice and strong work habits on and off the ice, which have become the backbone of the program. Make no mistake that these results have been achieved through hard work and commitment. Instead of resting on these results, the Jr Canes will remain focused on continuing to improve its programs to give players their best opportunity to succeed in their hockey careers. The goal of Jr Hurricanes/RYHA is to become the best hockey development program in the country, and we realize this goal will require continuous adaptation, teamwork, and commitment from all of its coaches and volunteers. We look forward to continuing to improve our program for our next generation of players that strive to play at these levels and hopefully one day in the NHL.